A couple summers ago I worked as a research assistant on the Oncology floor of Children’s Memorial Hospital in Chicago. In the clinic, I interacted with kids going through chemotherapy. Cancer is second leading cause of death each year in the United States. It kills 7.6 million globally each year. Without action this could increase by 80% in 2030 in low and middle-income families predicted by the World Health Organization projects#. Billions of dollars are donated to research, but we have yet to find a cure. Yet, we have made significant progress since the first use of nitrogen mustards and folic acid as antagonist drugs against cancer. Today, there are multiple forms of chemotherapy agents that target various aspects of cancer growth. While working in the clinic I reviewed patients’ anticancer drugs on their charts, and I often found myself wondering where these drugs came from. 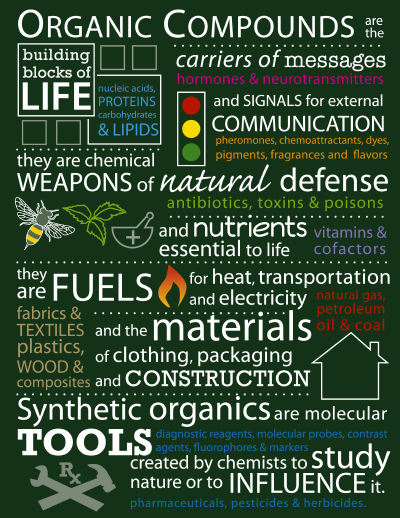 How did researchers know where to look for in nature to isolate such useful compounds? What characteristics would inhibit cancer and why? My primary research of the subject led me to an article about the historical achievements in Natural products and research. The article focused on the discovery of Camptothecin and Taxol the latter drug became my primary interest. In the 1950s thousands of plant extracts were collected by Dr. Monroe E. Wall, who was looking for phytosteriods that could function as precursors for cortisone while working at the USDA. Dr. Jonathan Hartwell became aware of these plant extracts and requested to screen them for anticancer activity. Camptothecin acuminata was the initial plant they studied. Because this extract displayed a strong cytotoxicity. In the 1960s, Taxus Brevifolia was of interest for similarly showing activity against the human oral epidermoid carcinoma cell line. At this point I realized that the original thousands of plant extracts weren't even related to the search of anticancer treatment. Rather Dr. Hartwell was able to piggback upon the work that was already abailable in order to test what he assumed may have anticancer properties. This seemed like a somewhat round about way of starting, but I'm not even sure what I was expecting. How else would one start? I then began to wonder what it was like working with the plan. Where is it from? What does it look like? Would I have ever walked past it inadvertently? So I refined my search to properties of this Taxus Brevifolia and this is what I uncovered. 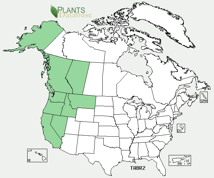 The Taxus Brevifolia is also known as Pacific Yew, and is native plant to the pacific northwest of North America. (see the map). This evergreen tree grows to about 10-15m tall with a 50 cm diameter. The bark is thin and scaly with wood that is hard and resistant to decay. The plant grows best on moist, rocky and deep soils. The species has been seen to develop along mount streams and shady canyons. It tolerates the shade and grows frequently among drier and warm environments.My next point of interest was the mechanics behind Taxol. I was hoping that my background in chemistry from CHEM 232 and CHEM 332 would allow me to understand this concept to the degree in which I initially set out to. I picked up my research again at the point I left off at, the properties of Taxol that give it anticancer qualities. So as I mentioned earlier, the original extract of Taxus Brevifolia was not as active against anticancer models in vivo. Yet, the in vitro cytotoxicity and in vivo anticancer activity correlation motivated Wall’s research group to identity its bioactivity-directed fractionation. In 1965 a large sample of the bark was scrutinized by Dr. Wall’s group until Taxol was identitfied as a “novel antiluekemic and antitumor agent” in 1971. At this time the structure of Taxol was finally determined by single-crystal X-ray crystallography. The process was time and energy extensive. They put taxol through Base-catalyzed methanolysis to form a nitrogen containing alpha-dydroxy ester side chain, the complex taxane core and methylacetate. C47H51NO14 + 2CH3OH --> C17H17NO4 + C29H36O10 +CH3CO2CH3 This left the structural challenge of determining where to connect the two hydrolyzed ester functions to the taxane core. The 7 and 10 positions were most likely as viewed by the team however a manganese dioxide oxidation experiment made them realize the actual structure must have the nitrogen containing alpha-hydroxy ester function at the 13 positon, instead of the 7 position. The structure was then reported in the Journal of the American Chemical Society. Not long after the structure was identified was its mechanism of action discovered probably because of the highly visual effect of taxol on microtubules. An integral part of the cytoskeleton of a cell, microtubules are hollow rods that continuously undergo assembly and disassembly making them very dynamic in nature. Tubulin is globular protein in microtubules. Its structure is dimeric consisting of both alpha and beta tubulin that bind to GTP. For more information about assembly watch this quick tutorial. Because microtubules are so dynamic in nature they are essential components of cell division. According to Arnal & Wade 1995, “Microtublule assembly requires the association of GTP with an exchangeable site on the beta-tublin subunit, GTP hydrolysis occurs at a stage during, or after assembly; hydrolysis is not required for assembly, but is a prerequisite for microtubule shrinkage… taxol blocks the cell cycle in its G1 or M phases by stabilizing the microtubule cytoskeleton against deploymerization.” This study looked used electron cryomicroscopy and image analyses to analyze the microtubule assembly in vitro. They found that the conformation of microtubules depended on when the drug was added in respect to assembly. Preassembled microtubules changed its structure only slightly when taxol was added , however the change was much more significant when the drug was added during its assembly. Although the former produces only a small conformation change, it does produce a full stabilization of the microtubules.# Taxol binds to preassembled microtubules with a stoichiometry that is close to one molecule per tubulin dimer. Therefore the stabilization accompanies the varying structural modifications depending on when taxol is added before assembly has taken place. 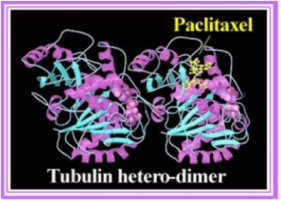 What this picture shows is paclitaxel aka taxol binding to the alpha and beta tubulin hetero-dimer. Notice that this 3-D conformation does not allow the microtubule to disassemble and therefore it is stabilized because the cell can no longer divide. This jmol image may also aid your understanding. This functions as an anticancer agent because its stabilizing nature exerts cell-killing effects on uncontrollable cell proliferation. A cancer cell grows and divides at an accelerated pace forming tumors that disrupt the normal functioning tissue. 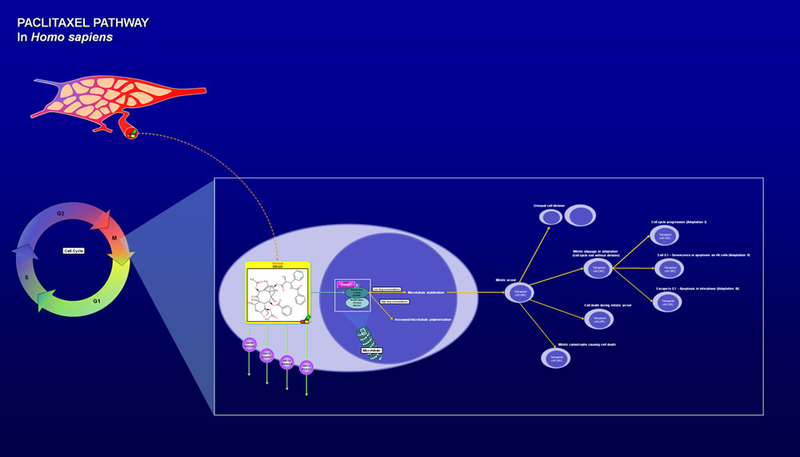 One way to monitor cancer is to control the cell growth by inhibiting the cell cycle. Taxol, also known as paclitaxel, directly binds the B-subunit inner surface which increases its affinity for neighboring molecules due to an induced conformational chance. The suppression of microtubule dynamics can prevent chromosomes from moving from the spindle poles to the metaphase plate thereby delaying or completely preventing the transition from metaphase to anaphase. This puts cells in a state of mitotic arrest in which cells may subsequently produce aneuploid daughter cells, exit cell cycle or continue progressing through the cell cycle as tetraploud cells, undergo apotosis, or cell death. When paclitaxel is bound to beta-tubulin, it is T-shaped and exhibits functional similarity to a segmant of the B9-B10 loop in the alpha-tubulin. The conformation permits intermolecular hydrophobic association like the irregularly stacked C-3’ benzamido, His-229, and C-2 benzoyl moieties. The microtubules cannot disassemble, therefore the cell cannot divide. Paclitaxel is prescribed to those with breast, lung, ovarian, head and neck cancer along with advanced forms of Kapsoi's Sarcoma. Some of the associated side affects include nausea, loss of appetite, change in taste, thinned hair, joint pain, nail discoloration, and tingling in hands or toes. Unusual bruising or bleeding, pain/redness at the injection site and abnormal bowel habits may indicate more serious side-effects. This is the active steromer (-)-paclitaxel. There are 11 stereocenters structured on a tetracyclic heptadecane skeleton. 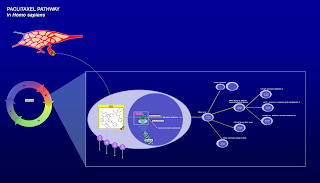 Wani, A. C., Taylor, H. L., Wall, M. E., Coggon, P., McPhail, A. T. Plant antitumor agents. IV. isolation and structure of taxol a novel antileukemic and antitumor agent from taxus brevifolia. J. Am. Chem. Soc., 1971, 93(9), 2325-2327. Arnal, I., Wade, R. H., How does taxol stabilize microtubules? Current Biology, 1995, 5:900-908. Great post! I really like that you addressed how the drug was discovered. I think that’s a really interesting process, and makes the science behind it seem more accessible. I’ve studied about taxol in class, but never in much detail, so it’s nice to finally know exactly what conformation change it causes, and how that affects MT polymerization. After reading your post, I’m curious as to why taxol is prescribed for those specific types of cancer, and not others. Also, does taxol have any other applications? I’ve heard that it is sometimes used to prevent scarring around coronary stents, but can it be used to treat other scar tissue as well?